There are many words investors might use to describe the current gold market. Most of them are unprintable here. But I have one word that should describe gold investors now. At least, those investors who want to make money. I’ll give you a hint now. They’re all gold producers. All trade at huge discounts. All await investors with steel in their spines to scoop them up and ride the next rally. Many people will tell you that gold is only bouncing a little before tumbling ever deeper into the Well of Tears. Sure. They may be right. Why is gold bouncing? Because the U.S. and China have agreed to hold low-level trade talks aimed at defusing the escalating rounds of tariffs. As I explained in my weekend column, “How to Reap a Bumper Crop of Profits,” I believe this optimism may be misplaced. But in the shorter term, this could be quite the tailwind for stocks. I will show you two more charts. Both sentiment indicators. Both showing that anyone who wants to sell has done so. 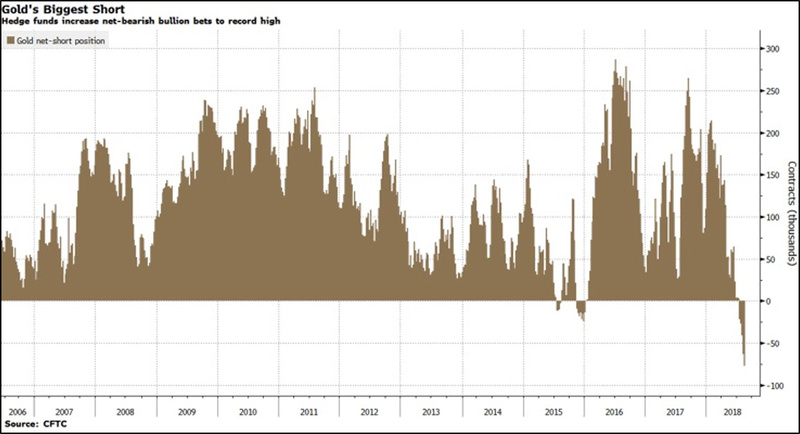 In the week leading to Aug. 14 — the latest data available — hedge funds and other large speculators increased their net short bets on gold. In fact, they raised those bearish bets to the most since at least 2006. Why? Because there’s no one left to sell. This is so bearish, you could put a ranger’s hat on it and call it Smokey. More importantly, this is so bearish, it’s much easier for the market to go up than down. So, consider these three gold miners that are trading near 52-week lows. Not explorers. Not developers. Gold MINERS. Gold miners priced like they suddenly ran out of gold. I’m talking about Goldcorp (NYSE: GG), Newmont Mining (NYSE: NEM) and AngloGold Ashanti (NYSE: AU). Let’s look at a one-year performance chart for all three. Holy mother lode! Look at the right-hand side of that chart. These stocks are getting pushed off a cliff! 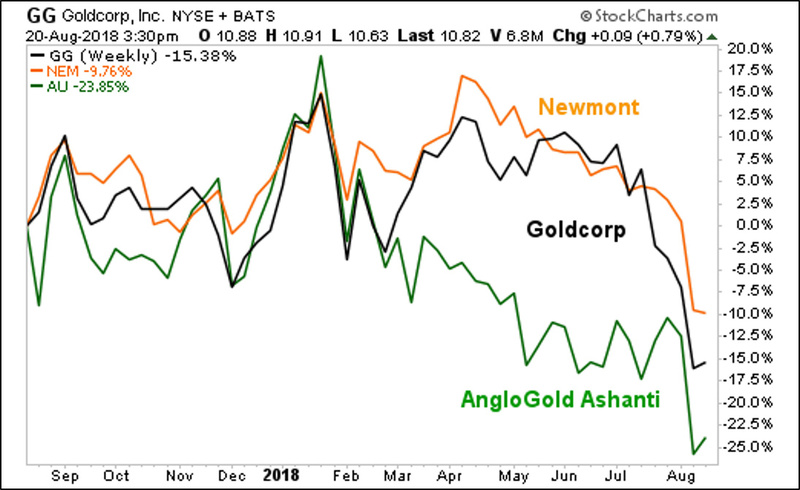 Meanwhile, Newmont and Goldcorp are getting beaten like redheaded stepchildren, yet both are mining blue bloods. think of LUNMF (Lundin Mining) Back in 2015 they purchased Fruta del Norte from Kinross Gold. Fruta del Norte was discovered in 2006 and is one of the largest new gold finds in the World. There are some very smart people running that company, but Ecuador presents special challenges. You know what old miners say: A rising gold price is the best discovery you can make. Are Gold coins such as those @ Lear Capital a smart investment to hold or better time to sell? Hi, Douglas. I can’t give specific investment advice. I can tell you that I like gold, and I own it. But I like well-leveraged miners more, because they’ll outpace gold on the next leg higher. That is a great article . I like the fact you mentioned that there are no more Gold Sellers ! Very good analysis ! I would like to ask you : I have lifetime membership with E-Wave Trade ( Weiss Research ) since the beginning of 2017 . I am trying to login and there is no way for me to reset the passoword. I guess with the changes to Banyan Hill , may be some issues came up . I apreciate your help and wishing you all success !